This book outlines some aspects of Jewish intellectual life in the nineteenth and twentieth century, presenting a narrative of the relationship between Jewish scholars and their cultural environment. It investigates the language of conformity and dissent and interprets it as an imaginative grammar, comprising an arsenal of images, concepts, and interpretations. There is a special focus on German roots, for Germany played a major role as an intellectual laboratory in the areas of the (new) branches of academic life. 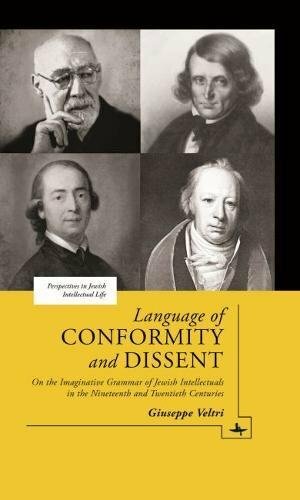 This book consists of four parts: i) Searching for a Scientific Language; ii) “And the Jews”: Political and Cultural History of a Conjunction; iii) Creative Languages: The Interstitial Spaces of Monotheism; iv) Disjunction: The Jewish Dissenter. A bibliography as well as detailed indexes of authors, scholars and subjects are included. If you have any questions about this product by Academic Studies Press, contact us by completing and submitting the form below. If you are looking for a specif part number, please include it with your message.